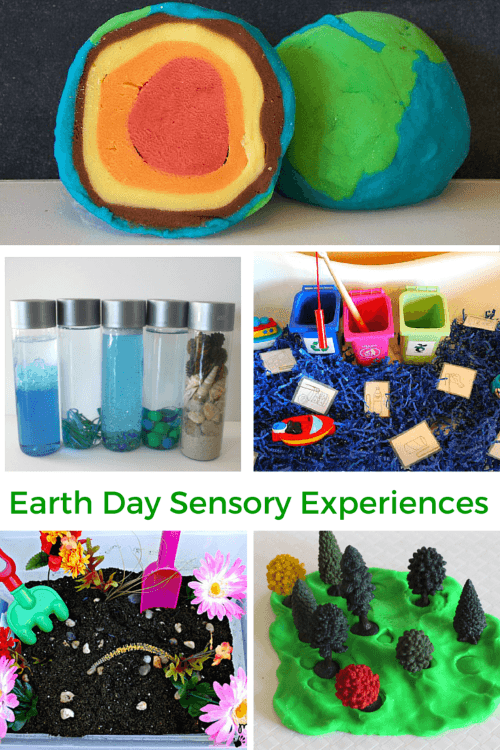 Kids love to learn about the Earth and these Earth Day sensory experiences are a fun and playful way to do so! 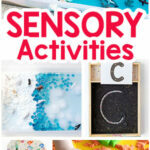 My children love learning while engaging their senses. I find that they retain so much more when they are able to engage many of their senses while learning about something. 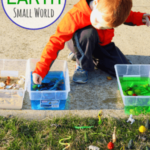 These activities are a great way to teach your child about the Earth, while doing so in a way that is hands-on and playful! 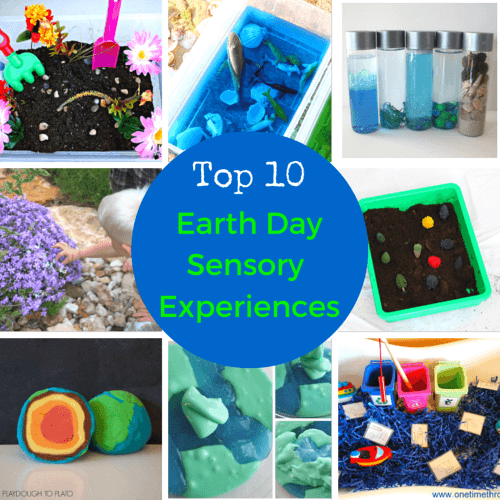 Here are my Top 10 Earth Day Sensory Experiences for Kids! 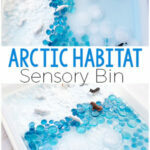 Earth Sensory Table Small World – This sensory experience is a fun way to learn about different habitats on Earth and which animals belong to each. 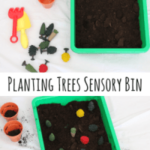 Planting Trees Sensory Bin – Kids will enjoy digging in the soil and planting toy trees. This is also a great activity for Arbor Day. Earth Day Sensory Bins from One Time Through – Both of these bins focus on sorting garbage into Trash, Recyclables, and Compost while teaching young kids to reduce waste and recycle. 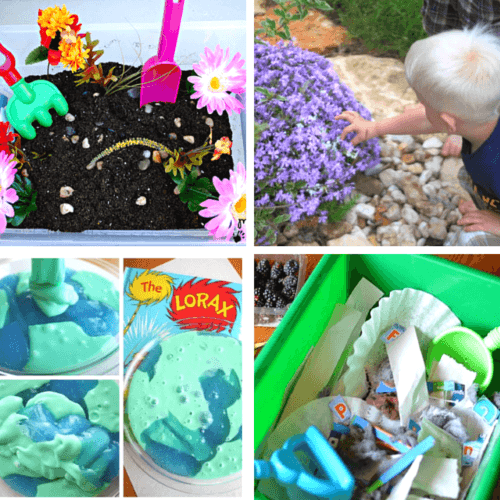 Layers of the Earth Playdough from Playdough to Plato – This play dough activity is a fun and playful way to learn about the layers of the Earth while developing fine motor skills. 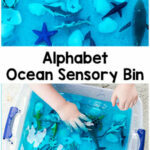 Earth Day Discovery Bottles from Little Bins for Little Hands – These beautiful sensory bottles are an excellent science exploration for Earth Day. 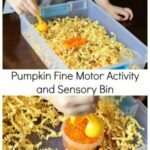 Junk Yard Sensory Bin from Stir the Wonder – This sensory bin is so much fun! Kids will love sorting the junk into Munching Machines. You can even turn it into a counting game. 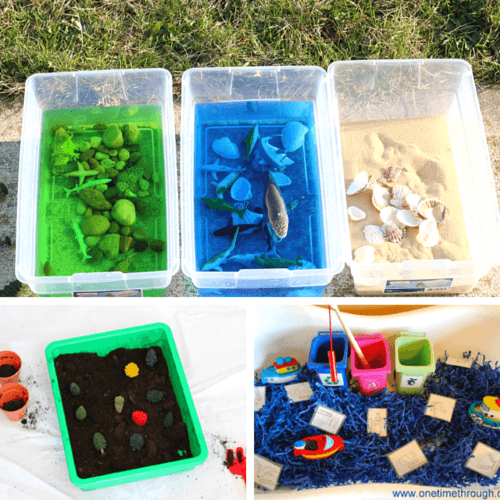 Garden Sensory Bin from Mess for Less – This sensory bin combines soil and flowers to give young kids a chance to practice gardening on their own. Nature Scavenger Hunt from Hands On: As We Grow – Get outside and explore nature while searching for the items on your list. This is so much fun and so easy to do with your kids! 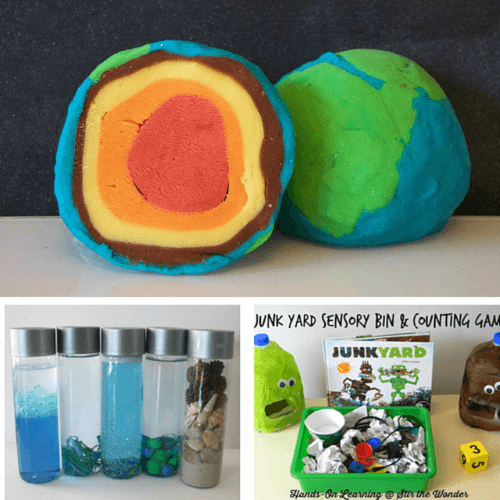 Planet Earth Slime from Little Bins for Little Hands – This slime is an exciting, tactile experience that pairs up perfectly with the book The Lorax. Compost Sensory Bin from Growing Book by Book – This sensory bin pairs up perfectly with a really great book while teaching letters and letter sounds. How cool is that?! Make sure you check out all the other Top 10 Earth Day posts!